Delightfully weird, whimsical, dark, macabre; words that describe Edward Gorey. One of the most puzzling and extraordinary illustrators of the past century, Gorey has written more than 90 books, illustrated over 60 others, designed sets and won a Tony Award for the Broadway show Dracula. His first book, The Unstrung Harp, was published in 1953. The book is dark and comical, just as is every book that followed. In 2000 shortly after Gorey passed away at age 75, one of his dear friends, Alexander Theroux, wrote a book in tribute to his friend titled, The Strange Case of Edward Gorey. 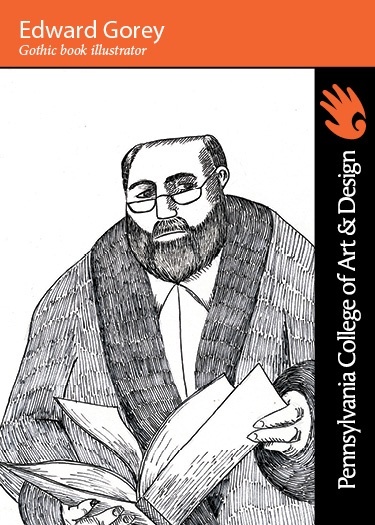 This book is an intimate look into the life of Edward Gorey, revealing him with wit and fervor. Known for his ink drawings of characters in Edwardian dress. Attended the Art Institute of Chicago, and obtained a BA in French from Harvard. Published many books under anagrammatic pseudonyms, such as Ogdred Weary. Well known for his animated credits to the PBS series Mystery! Thought of himself as an author first, and compared his work to that of Lewis Carroll.